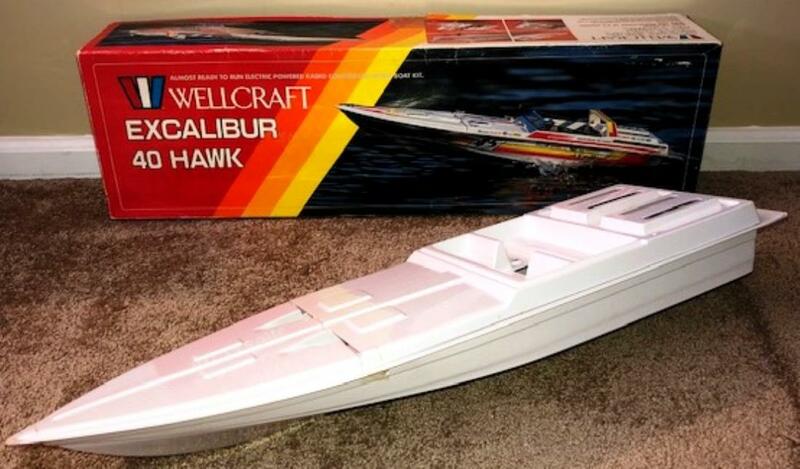 This is a vintage 1/10th scale NIB Excalibur 40 Hawk electric r/c boat that I picked up from Ebay in January 2019 for a first and best offer of $70 USD that was surprisingly accepted by the seller after it was initially listed for $120 USD. It was produced by the Asahi corporation in Japan back in the 1980's and is modeled after the 1985 1:1 Excalibur 40 hawk offshore V-bottom powerboat originally manufactured by Excalibur and then Wellcraft. 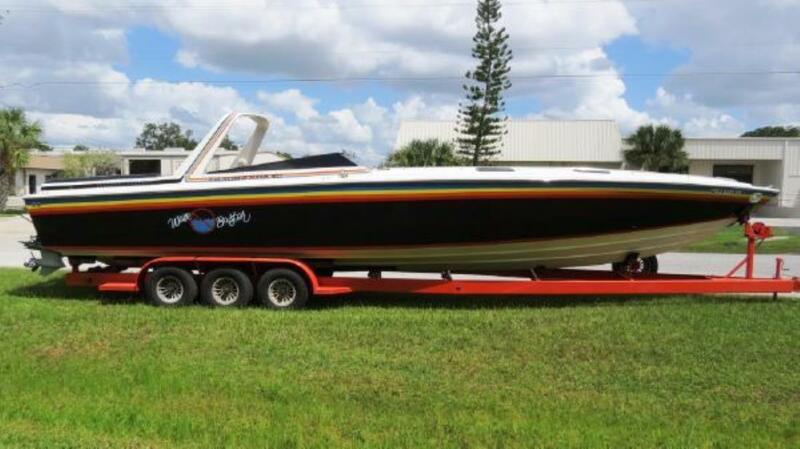 The 1:1 was produced for a very limited time from 1982-1985 with the 1982 model being named Powerboat Magazine's offshore boat of the year. 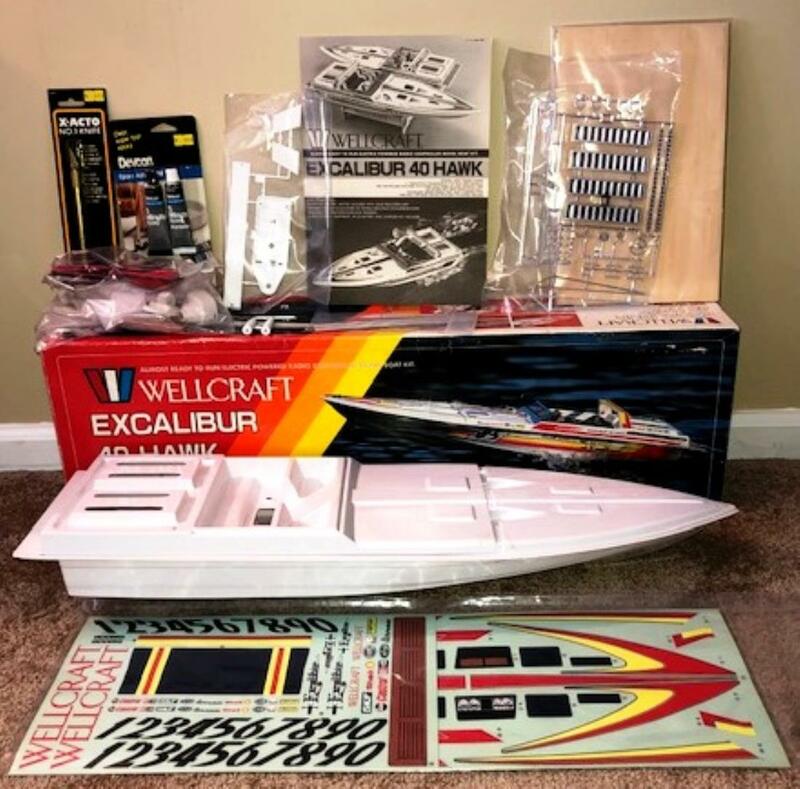 Excalibur manufactured the boat from 1982-1984 after which Wellcraft purchased Excalibur and took over production of the 40-foot long (~12 meters) Hawk under the Wellcraft name for one more year in 1985. 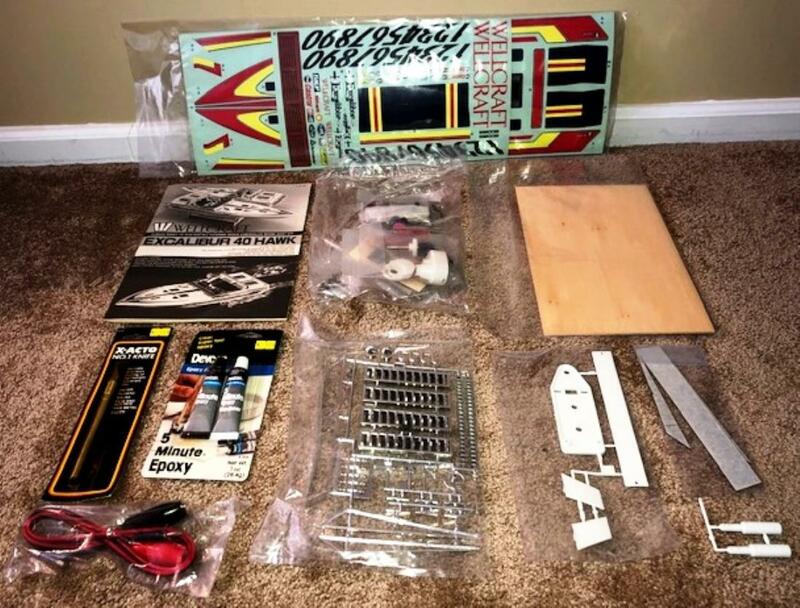 This r/c example came with everything NIB in mint condition and interestingly requires assembly like the vintage boats from companies like Graupner and ABC Hobby and unlike the vintage boats from MRP which came pre-assembled. 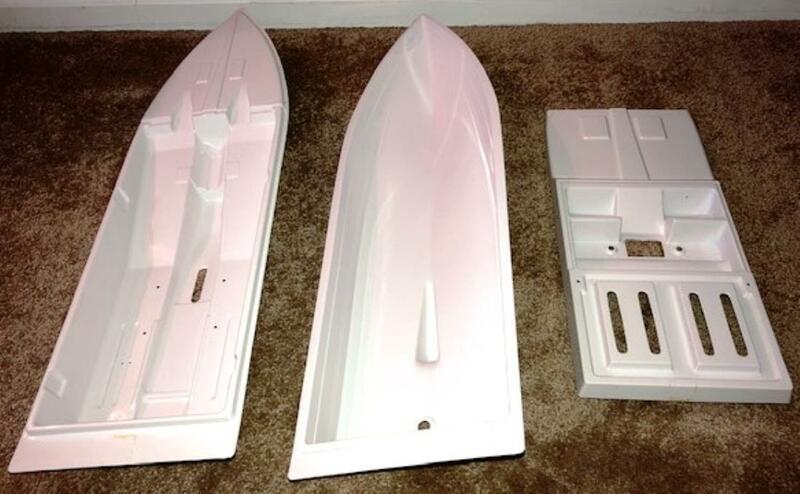 The boats from Graupner and ABC Hobby are better quality while the MRP boats seem to be of similar quality. 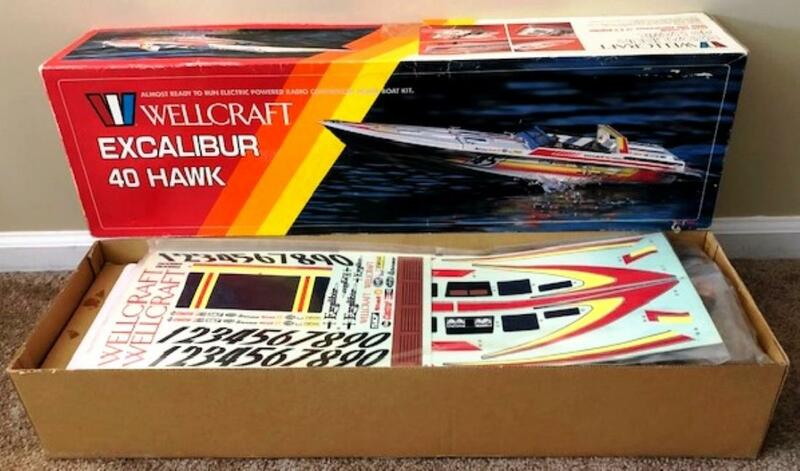 I have no childhood connection to this particular model but do remember the advertisements for them in a variety of different r/c magazines BITD and since I'm a big fan of old fast-electric r/c boats and already have a runner this was an easy decision to make. This will remain NIB while I have fun with the runner. Thanks for looking and hope you enjoy. Factory fresh time capsule. Box is in beautiful shape. 3-piece hull. 1984 1:1 example. Really like these vintage craft, the modern day equivalents are faster but they’ve lost some of the magic. Nice being in kit form too. Lovely example. @ClODBOX: Absolutely. There's no beating today's brushless powered electric boats but there's just no 1:1 history behind them or personality to any of them which is sad especially since 1:1 offshore power boat racing is alive and well. That's why I primarily focus on vintage fast-electric r/c boats.